Planning a villa wedding in Bali can be both very exciting and quite daunting all at the same time. When most people think of Bali they imagine either stunning hotels or exquisite villas decked out in luxurious comforts and, of course, a nice refreshing swimming pool. Having your wedding in a Bali villa is an absolute dream come true, but can it become a reality? 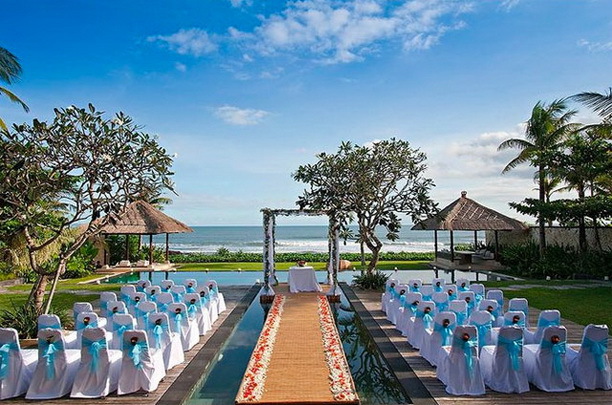 How much does a Bali villa wedding cost? Villa weddings are world renowned for being quite pricey. However, the great thing about Bali is it’s overall affordability. Foreigners move there because they can enjoy creature comforts that would be far out of reach in their own countries. And the same applies for weddings. Villa weddings in most parts of the world would require very deep pockets, but in Bali there are certain villa wedding packages that are genuinely quite affordable. Couples tend to choose a villa wedding because they offer a more intimate and luxurious experience than some of the other types of weddings. Villa weddings can also provide the added convenience for the bride and groom (as well as the guests) to be able to stroll back to their rooms in the moonlight once the festivities come to a close. Offering a lovely romantic experience for all. Villa wedding costs in Bali range quite considerably depending on things such as number of guests, catering requirements, size and location of the villa and elements such as decorations and entertainment. Opting for a villa-wedding package helps to clarify what you will get for your money. All details of the package are very clearly listed and prices are transparent, so no nasty surprises at the end when you get your bill. Your Bali villa wedding cost does not need to force a remortgage of your house so that you can enjoy your dream wedding. Bali offers some fabulous locations surrounded by breathtaking landscapes and most of these amazing places host a pretty stunning villa or two. Couples have heaps of venues and villa wedding packages to choose from. If you want to stay central and near the heart of the tourist hotspots then the amazing 5-star private villa complex called WakaGangga is a great choice. Or you can opt for Anugrah Villa, which has a cliff front ocean view in Uluwatu with the most fabulous sunsets. Nusa Dua boasts some spectacular white sand beaches and is a pristine, well kept area of Bali. At the cliff front of Sawangan Beach in Nusa Dua sits a stunning villa, which is part of Heavenly Residence. Aptly named, this villa boasts an infinity pool and a beautiful wooden sundeck that provides a wonderfully exotic ambience to your wedding celebrations. 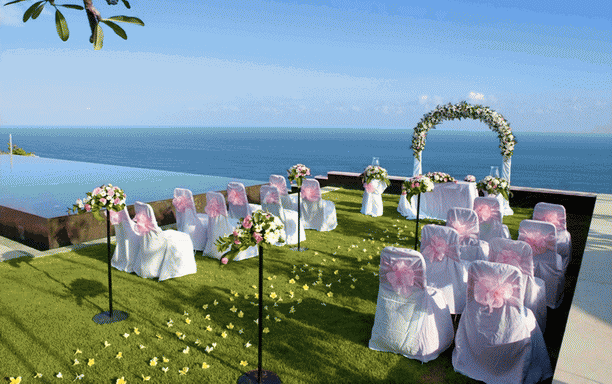 Villa wedding Bali prices do vary depending on the venue, which makes the villa packages on offer here so easy to navigate. Whatever your budget it will be hard to go wrong with such a wonderful range of wedding package choices available. Planning a villa wedding in Bali has never been as exciting as it is now, with so many options to choose from, couples can go wild with their fantasies and dreams and create a wedding experience that will be the envy of all their friends.